The front camera behind the rearview mirror monitors left and right lane markings (in white or yellow). If your vehicle is getting too close to detected lane markings without a turn signal activated, the system, in addition to a visual alert, applies steering torque and alerts you with rapid vibrations on the steering wheel, to help you remain within the detected lane. 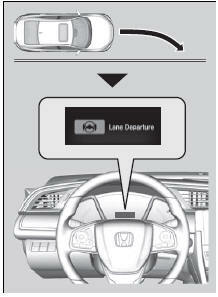 As a visual alert, the Lane Departure message appears on the driver information interface. If the system determines that its steering input is insufficient to keep your vehicle on the roadway, it may apply braking. Braking is applied only when the lane markings are solid continuous lines. The system cancels assisting operations when you turn the steering wheel to avoid crossing over detected lane markings. If the system operates several times without detecting driver response, the system beeps to alert you.